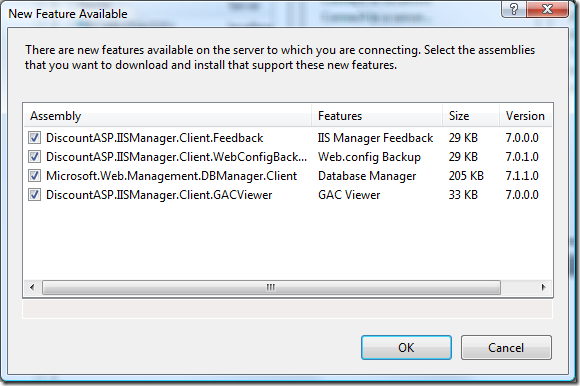 DiscountASP.net who has been a very close partner of the IIS Team leading several offerings of our platform - including IIS Manager Remote Delegated Access to the Web Site and many other cool tools - has just built and released yet another cool module that extends the IIS Manager capabilities by having a GAC Viewer for their customers. 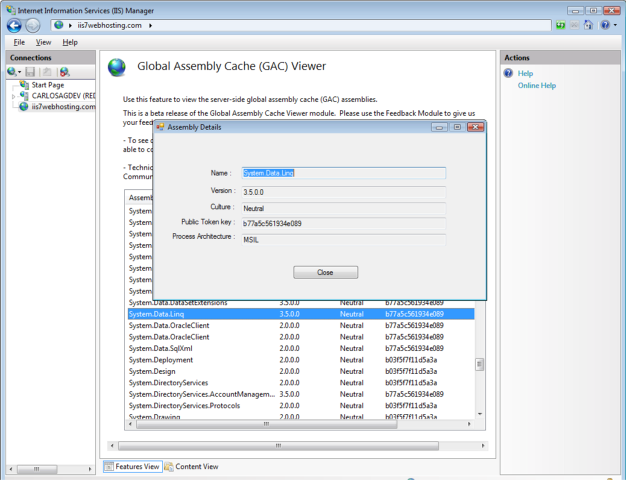 The GAC Viewer is still in Beta but I think it showcases some of the cool stuff that IIS 7.0 platform brings to the table providing extensibility from end-to-end, whether its Runtime, Configuration, IIS Manager, etc. Note that DiscountASP.net also offers other modules, including some of our recent modules like Database Manager, Request Filtering and others (I already had some of them installed and that is why it doesn't show in this list) and their own Web.config Backup and a Feedback Module. All I can say is that it makes me extremely happy anytime I see someone take advantage of the platform in such interesting ways. your e-mail addresses on your homepage are broken. I have a question about your Excel XML Writer. Please check your mail server configuration so that I can resend my message. Thanks.